IndoAustay offers exchange programs for Australian students in Years 10 and 11 to study in Indonesia (northbound exchange) and for Indonesian students at the same level to study in Australia (southbound exchange). This page contains general information about the secondary student exchange program. For more detailed information, see the Forthcoming Student Exchange page. The Exchange is expected to enhance Australian students’ insight into an Asian culture at an influential stage in their scholastic and civic development, as well serving as a huge incentive to advance their Indonesian language studies. The exchanges are country-to-country, not family-to-family or school-to-school, and immerse the students in the family, school and cultural life of the host country. Exposure to the language occurs naturally and continuously. 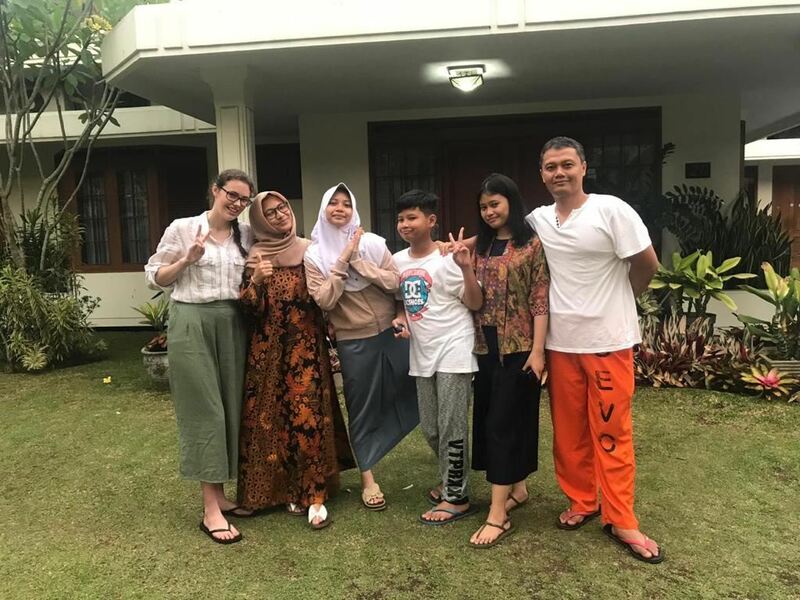 Australian students participating in the exchange are placed with schools in and near Bandung or Jogjakarta (in Java) and are allocated to nearby homestays with families who have a son or daughter in the same school at the same or similar level. In the future, we plan to include Lampung (Sumatra) as an exchange destination. Australian exchangees travel together as a group from Melbourne and are met on arrival in Denpasar or Jakarta by an appointee of IndoAustay, who ensures their smooth transfer to the connecting flight (to Jogjakarta) or bus (to Bandung) on the same day. On arrival in Bandung or Jogjakarta, exchangees are accompanied by representatives of YMAS to their homestays. Each exchangee and each host family is allocated an YMAS contact person who monitors their progress for the duration of the exchange. A fortnight after the exchangees arrive in Indonesia, Mr Tata Survi (an Australia-based director of IndoAustay) arrives in Jogjakarta and is available for on-the-spot liaison with YMAS personnel. Exchangees live as a member of the family to which each is billeted. Each student will have their own bedroom, furnished with bed, table and fan. They are expected to be involved in all the daily activities of the family beyond their school attendance. They are subject to the rules of the household and the school and are not free to move beyond the confines of the immediate neighbourhood without prior approval of either. They are not permitted to leave their host town or city other than on family or approved group excursions with adult supervision, such as visits to Tangkuban Perahu volcano or Prambanan and Borobudur temples. Australian exchangees and their parents are required to sign agreements (modelled on those used Southern Cross Cultural Exchange), which set behaviour guidelines and protect IndoAustay, AIAV, AIA NSW, YMAS and their members against recourse for risks to which the exchangees could be exposed and for risk to third parties that could be caused by exchangee mishap or misdemeanour. Extensive guidelines concerning travel and homestays are updated regularly and are issued to exchangees at the time of acceptance of their applications. A cross-cultural information afternoon is scheduled in November before each northbound exchange and attendance is compulsory for all exchangees. These sessions includes references to the Australian Department of Foreign Affairs & Trade travel advice regarding Indonesia and to the minimum guidelines of the Victorian Registration & Qualifications Authority including child safe standards which govern IndoAustay's exchange. YMAS is an independent foundation which has taken over as our Indonesian exchange partner from Universitas Pendidikan Indonesia (UPI). YMAS is overseen by UPI's former deputy vice-chancellor, Prof Aminudin E. Aziz. It is the location of AIAV's in-country two-week intensive Indonesian language study (immersion) programs for secondary students. It is a small city (population about 500,000) with most of its interesting features being very accessible, and has good transport and telecommunications connections with Jakarta, Denpasar and beyond. It is traditionally a very international city, attracting many foreign students and academics to its universities, and consequently is sympathetic to their needs. Together with the nearby city of Surakarta (Solo), Jogjakarta represents the cradle of Javanese civilisation, which underpins so much of Indonesian culture. It is Indonesia’s third largest city but nowhere near as daunting in size as Jakarta. It is the focus of Sundanese culture, which permeates most of West Java and Banten provinces. It has a rich history, both in pre-colonial times and under Dutch rule, and was an important locus for Indonesia's independence movement. It was also the site of the 1955 conference of the Non-Aligned Movement. It has a strong academic sector and is the centre of Indonesia’s textile industry. The city is surrounded by quite spectacular scenery. IndoAustay has been able to form a strong partnership with Bandung's University of Education (UPI), which has led to YMAS serving as coordinator for north- and southbound exchanges centred on West Java. The city has an interesting history of migration. It has flourished in the last half century on the basis of transmigration from Central and East Java and Bali, but its earlier beginnings were supported by Chinese immigration. Its original inhabitants had their own syllabic script quite different from the Sanskrit-based Sundanese, Javanese and Balinese. It was put on the map in the modern era by the twin towns from which it evolved having a ringside seat in 1883 at the world’s greatest volcanic eruption in recorded history – Krakatau, on the other side of the Sunda Strait. The city has depended on being a port for export of agricultural merchandise, but now has a vibrant education sector, while the hinterland is famous for its national park wildlife. For more detailed information about forthcoming exchanges, see the Forthcoming Student Exchange page. For Indonesian secondary school students with an interest in visiting Australia on a southbound exchange, we recommend that you contact the head of English language studies at your school. This teacher will refer you to Bapak Neri Herwandi of YMAS (ymas.oz@gmail.com). *IndoAustay is a not-for-profit volunteer-operated public company limited by guarantee of its members, the Australian Indonesian Association of Victoria (AIAV) and Australia Indonesia Association of NSW.